SEOUL, Jan. 8 (Yonhap) -- North Korea's official Web site went dead on Saturday after what appeared to be an attack by South Korean hackers angered by the communist state's ongoing hereditary power succession and its artillery assault on the South in November. The hacking, claimed by multiple users at http://dcinside.com, also appeared to involve North Korea's YouTube and Twitter accounts, which began showing content derogatory of Pyongyang's leader Kim Jong-il and his heir apparent instead of usual propaganda material. The online row coincided with the presumed birthday of Kim Jong-un, Kim Jong-il's youngest son being groomed to take over the impoverished but nuclear-armed country. It also came as the North stepped up its call for mending ties and restoring dialogue with the South in an apparent effort to win aid. South Korean officials believe Kim Jong-un enjoyed his 28th or 29th birthday with low-key celebrations that included music recitals and athletic meetings. 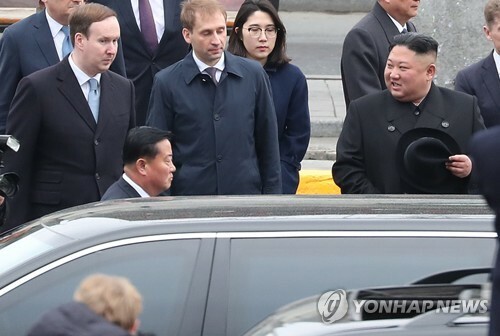 An activist group here said Friday, citing an unnamed source, that the birthday of the leader-in-waiting was not designated as a public holiday, calling it a sign of doubts about his credentials among North Korean power brokers. "Let's create a new world by rooting out our people's sworn enemy Kim Jong-il and his son Kim Jong-un!" one tweet read. Another sought to convince readers that the removal of the dynasty would lead North Koreans to live "as happily as South Koreans." Kim Jong-un was unveiled to the world as a four-star general and later named as a vice chairman of the Central Military Commission of the ruling Workers' Party in September. Little remains known about the way he thinks of his country and its relationship with the outside world. North Korea opened the Korean-language Twitter account @uriminzok in August and has since tweeted about 1,300 messages, drawing nearly 11,000 followers as of Saturday evening. North Korea also opened an account on Facebook last year, surprising outside observers, but it no longer operates. On Saturday, Uriminzokkiri, a Web site operated by the North's top organ handling inter-Korean exchanges, stopped operating after a large illustration appeared on its front page, showing the Kims bowing to win top benefactor China's backing for the succession. The site is considered the main Internet propaganda channel for North Korea and is managed by the Committee for the Peaceful Reunification of the Fatherland, which made the proposal for inter-Korean talks earlier in the day. The apparent hacking on Saturday came after Uriminzokkiri operators were reportedly duped last month into carrying a poem on a message board that called Kim Jong-il and Kim Jong-un harsh names. Users at the South Korean Web site, dcinside, claimed that Uriminzokkiri operators held them responsible for the tricky poem and mounted a DoS, or denial-of-service, attack on them in retaliation. That again incited them to hack the North Korean site. The high-tech war of nerves involving South Korean hackers, if confirmed, could be a new entry to the long-running rivalry between the two countries that remain divided after the 1950-53 Korean War. The war technically continues to this day as it ended in a truce. On Nov. 23, the North mounted an artillery attack on a western South Korean border island inhabited by civilians, killing four people, including two marines. Tension sharply rose on the peninsula over the attack, stoking fears of war and prompting South Korean President Lee Myung-bak to vow retaliation. "We have done what our Defense Ministry was unable to do," one South Korean user wrote on Nate, a portal site, referring to the presumed hacking. Many even hailed it as an act of retaliation for the artillery attack while some bemoaned that the tweets derogatory of the Kims could not be seen by most of the North Korean public. South Koreans have turned more hard-lined toward the North in recent weeks according to local surveys. Users who claimed hacking the online North Korean propaganda routes had gathered around a new message board dedicated to discussions on the artillery attack. North Korea runs a massive cult of personality around its 68-year-old leader and his family, and any defamation of the leadership is a sin punishable by death. Albeit often unsuccessfully, the North retains harsh controls on its impoverished 23 million people to keep them isolated from outside information. Kim Jong-il himself took over the regime after his own father and North Korean founder Kim Il-sung died in 1994. Kim Jong-il is believed to have suffered a stroke in 2008.